I didn’t see a 2019 thread started yet. I just bought this and I like it. I’ve been sprinkling liberally on many things. I bought this recently too, and I’ve been using it on various meats and stews. I added it yesterday to an Italian sausage pasta sauce that called for anchovies which I didn’t have. I was going to substitute fish sauce , but I was out of that too. 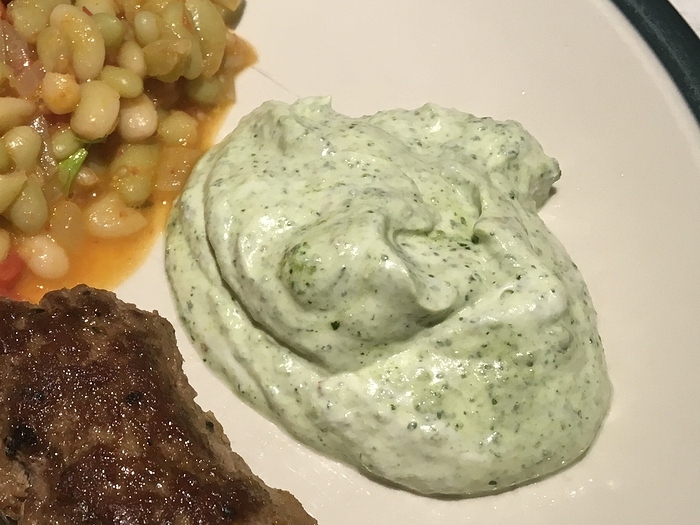 The sauce was fantastic! I agree that you need to use a pretty generous amount to get the right taste. I read a review that said it was somehow spicy…? Is that right? I am totally wimpy. Is this mushroom powder only? If it is, I’m on my way to TJs! 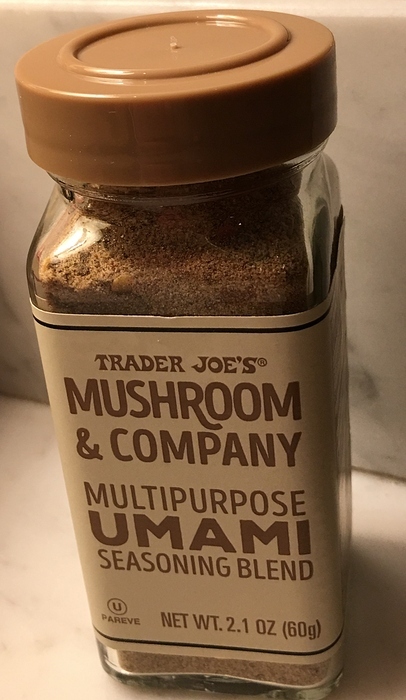 Mushroom Umami seasoning blend ingredient list. @Ttrockwood I don’t find it at all spicy (but I am a chili-head). How do you use it?? Would it work like a seasoning salt on veggies? 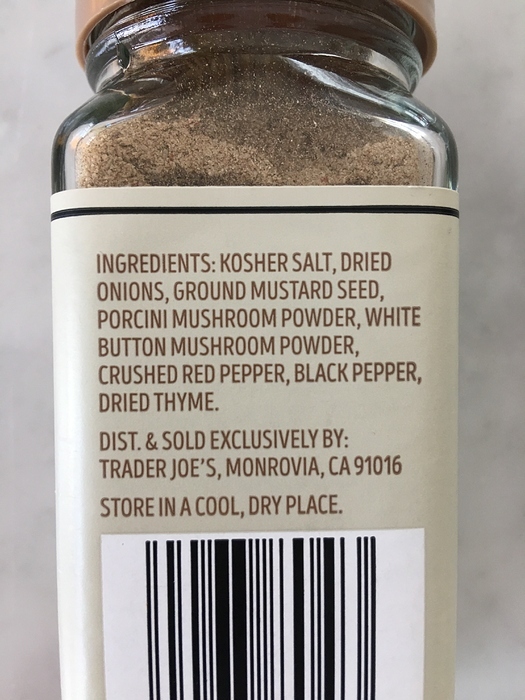 Or more like a powdered spice and should be incorporated when cooking…? The image of giving chili pepper a side-eye made me laugh out loud. It’s so funny - even though we don’t know each other, we do know each other! I knew any small amount of chili pepper would give you pause. This past week, I used it in place of furikake for a quick lunch. I sprinkled it on some brown rice with sautéed tofu and soy sauce. I added some ribbons of roasted seaweed on top and a drizzle of sesame oil. It hit the spot! I’ve been using it mixed in with things like green chile stew, baked chicken, pasta sauce, burgers, etc. I haven’t tried it just sprinkled on top of anything. The texture is pretty powdery. If you try doing that, please report back! Thank you for the photo of the ingredients, digga. Doesn’t seem to be exactly a Mushroom Powder, but a nicely thought out spice agent. I would buy it if I see it at my local TJs. I just put about a 1/8 teaspoon on my tongue. I noticed a slight hint of spice on the back of my throat as I swallowed. My sample had a tiny piece of chili flake. I really like spicy food but in the amounts one would use this I would have no problem using it to season food for my heat sensitive friends. It mostly tastes like very salty yet interesting onion powder. Oooh your lunch sounds delicious! I have a dim view of TJ’s. I go there and find I don’t buy much. I find it also VERY expensive. I am also a home cook 90% of the time, eat out 10% and I don’t usually buy processed foods, which seems to be the appeal of TJs. I went this week. I watch this young lady buy 4 or 5 packaged salads. I quietly said to myself, “why not make your own salad”, it is not hard. It looked like she was stocking up for the week. I did buy this AWESOME blood orange carbonated drink and I loved it. Cant recall the name. It was gone in one day. TJs seems to be a place for the young and busy, which is fine. I am neither. Ghost Pepper Cheddar - Meh. Neither the heat nor the pepper flavor are very pronounced and the cheddar is decent but that’s all. If I’m buying a Ghost Pepper Cheese, I want to regret it! Bamba Peanut Snacks - Nay. Slight chemically tasting peanut butter with the texture of a slightly damp cheese puff. Because to do that you have to buy many ingredients and wash and prepare them all. (And washing lettuce usually involves a salad spinner, which would take a lot of room in an apartment.) Maybe she doesn’t have a lot of time to do this. Maybe she doesn’t have the energy to do this . Better than she get some vegetables than skip them entirely. 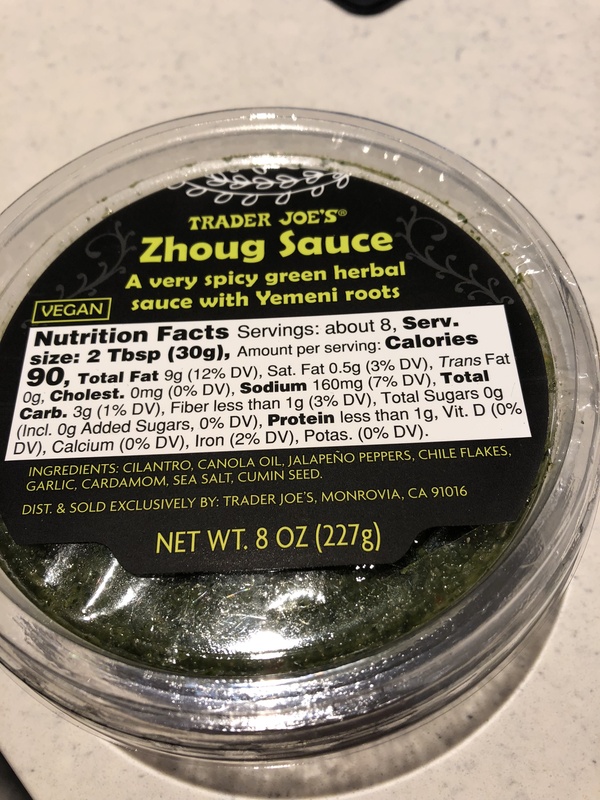 TJ’s Zhoug continues to be a big YAY for me. 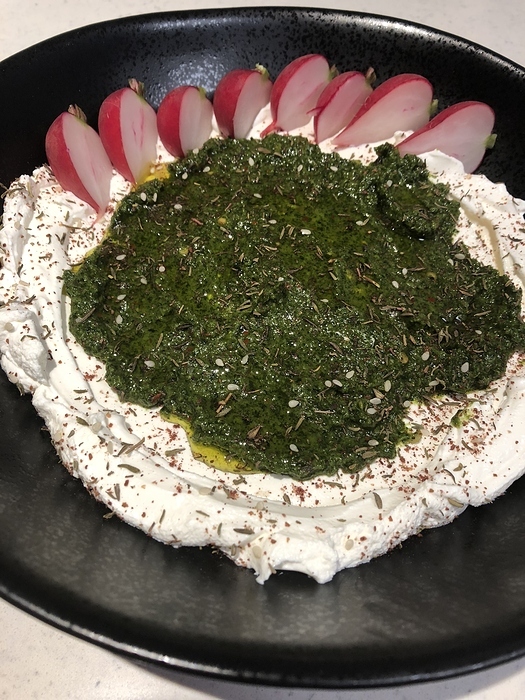 Very spicy - good drizzled on grilled or broiled meat, excellent as a party app spread over labneh or super thick Greek yogurt, sprinkled with sumac and za’atar and drizzled with olive oil, great mixed with Greek yogurt to accompany some wimpy homemade merguez. I’m having a hard time picturing the cardamom, but cilantro as the first ingredient makes my mouth water. Where is this located in your store, near the other dips/hummus/pestos, I’d guess? Should be good on pasta and popcorn!